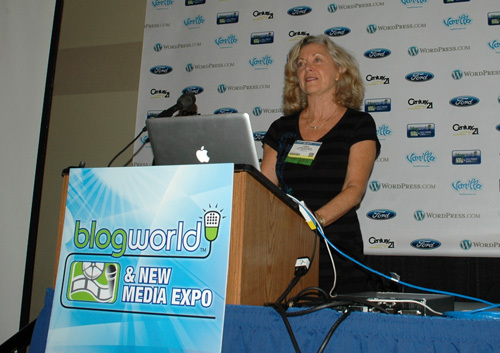 I presented a content creation session at BlogWorld NYC in May 2011 called How to Write For and Engage the 50 Plus Marketplace Online. If 50 plus consumers are of interest to your business, cause or study, you should find the slides here of value. When I write for Boomer Tech Talk, my focus is on providing easy to understand tips on social media and technology that boomers can use for themselves, their business and their parents or other significant seniors in their lives. To prepare for my presentation, the first step was to provide an educated overview of that marketplace, including why it is valuable to attract these readers and what interests and concerns them. Following is a list of acknowledgements for interviews and books that were kindly provided to support my preparation, as well as resources that I accessed. I co-presented with Eva Abreu. You will see in the slides that I presented part one and Eva presented part two which focused on case studies. It was a pleasure creating this presentation with her. Although, there is a message on this presentation frame saying “view on slideshare”, you can see these slides right here by clicking on the arrows at the bottom of the show.